We’re taking a trip to Cancun, Mexico in a week, and so we’ve been looking for ways to sample south-of-the-border flavors as a fun way to gear up and get excited. * Today, I sat down to write a post about a delicious Mexican meal we ate yesterday, and I made myself a snack to enjoy while writing. I doubt I’m the only person who gets hungry when reading and writing about food. I don’t usually snack while I post, but this is the sort of activity weekends are made of at our house. This simple snack verging on a meal is known in our house as Chip N’ Chee. It was christened by our friend Jonny, who prefers to top his Chip N’ Chee with kippered snacks. My version consisted of Nacho Chips, sliced black olives and Colby Jack cheese, melted in the microwave for about 30 seconds, served with smoky jarred Frontera Habenero Salsa and a Tecate beer. It can be made more elaborately with jalapeno, diced tomatoes, and onions then heated in the oven and served with sour cream and guac, but I went for simplicity today. Are tortilla chips and melted cheese an authentic Mexican snack? No, but it has some authentic elements,** and I think it is fair to call it Minnesota-Mexican. *** Yesterday was a lazy day that started with sleeping in and then eating a hearty brunch sandwich. That sort of morning meal is best followed by either a late lunch, or an early supper, whichever suits your fancy. We fancied a late lunch. We were downtown running errands yesterday afternoon and found ourselves hungry, so we decided to stop for a mid-afternoon bite. 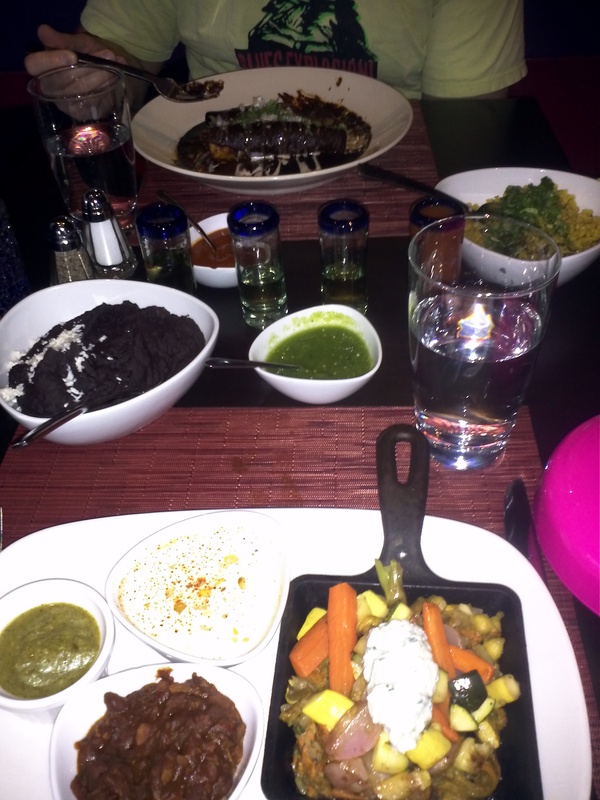 I was shuffling through my mental list of restaurants to try, and fortunately, our upcoming trip to Mexico jogged a memory of a recent Heavy Table post about Rosa Mexicano, a new Mexican restaurant in downtown Minneapolis. I was able to locate the restaurant’s address quickly on my handy-dandy new smart phone. Rosa Mexicano is a Mexican restaurant that has been around since the ’80’s in New York and Miami, and just recently showed up in Minneapolis on the corners of 6th and Hennepin. We arrived and were seated immediately in the dining room. The decor is colorful and sleek, and there is zero kitch which is ubiquitous with Mexican restaurants throughout Minnesota. **** The dining room was wide open, and about half full of diners, which I would imagine is a decent crowd on a Saturday afternoon on which a snowstorm is expected. We sat at a two-top in the center of the room, and I faced a tiled blue fountain above which was suspended a mobile with a hundred or so small, identical white human sculptures poised in mid-dive and suspended by fine wire at varying levels above the fountain’s square pool. Other than the impressive fountain and diver mobile at room’s center, the only decor to be seen are straight-sided glass vases displayed along the wall separating the dining room from the bar, each containing a liquid dyed different colors with, what I guess, was food coloring. The walls, tables and chairs are painted in blocks of purple and pink, a nod, I’m guessing to the restaurant’s moniker. Our server was raring to go and encouraged us to try the famous guacamole, which is their signature dish, made table-side on a cart. I glanced around the room and determined that the big pot of guacamole would be too much for me today unless it was the only thing I was going to eat, so we decided to try it another time. Again, at the suggestion of the author from the Heavy Table article, and in preparation for Mexico, we decided to select a flight of three tequilas to share. We opted for Reposado tequilas; tequilas that have been rested on oak barrels for a time. We selected the Hurradura, Corazon and Tres Generaciones, and we liked them all, but liked the third the best. The flight is served in skinny hand-blown shot-glasses of uneven size and were accompanied by a 4th shot glass containing a salty and spicy tomato-y “Sangrita,” aka, chaser, which we sipped, but didn’t finish. After perusing the menu for a time I opted for Tacos Vegetales a la Brasa, which are Skillet Roasted Seasonal Vegetables topped with a soft herbed cheese and served with red bean chili, corn esquites and a tomatillo mocajete salsa. Per the title, the roasted carrots, onions and green and yellow zucchini squash arrived in a small square skillet, with each accompaniment in its own separate dish, perched on top of my plate. The dish was served with a side of flax tortillas, which arrived in a pink plastic tortilla warmer. The pink plastic serving dish was, in my opinion, the only cheesy element of the restaurant’s overall presentation, but I guess if you are going Rosa, you go all out. I was a little nervous about flax tortillas and considered asking them to bring me corn instead, which are served with all of the restaurant’s meat-centered dishes. I kind of hate how vegetarian dishes are always accompanied by healthier breads and sides than omnivore options. Just because I don’t eat meat doesn’t mean I am trying to eat extra-healthy all the time. I presume in this case, the corn tortillas served with the non-vegetarian dishes contain, or are cooked in pork or beef fat. Unlike the numerous disappointingly dry whole wheat buns I’ve eaten with veggie burgers around the world, the flax tortillas were fresh, not overly grainy and overall quite good. Bjorn chose the Enchiladas Mole Xico, which consists of two corn tortillas filled with shredded beef seasoned with chipotle peppers and topped with Veracruz mole made with raisins, plantains, hazelnuts, pine nuts, ancho and pasilla chilis and garnished with Mexican creama and queso fresco. In addition to our individual plates of food we were served a generous bowl of the house rice topped with cilantro and another ample serving of refried black beans topped with queso fresco as well as two salsas: a smoky pasilla de Oaxaca which we loved, and a salsa de tomatillo y Habanero, which we liked less. As a whole, we both thought the meal was special. The food was beautifully presented and the flavors were well-developed and were surprising and unique, compared to almost all Mexican food that either of us have eaten. There was an obvious attention to authentic flavors and careful seasoning. Of everything on the table, I most enjoyed the refried beans and the corn esquites. The refried beans were creamy and tasty. Corn esquites was new to me, made of fresh corn cut off the cob, and served in a creamy sauce with cayenne pepper and Cotija cheese. I also enjoyed the dollop of creamy, mild, herbed cheese on top of my veggie tacos. Using only a touch of cheese has become fashionable in higher-end Mexican restaurants because it is more typical of authentic Mexican cuisine. It is a contrast to the melted-cheese encrusted plates at a typical Mexican restaurant in the Midwest. I like cheese though, so I was glad they didn’t skimp. 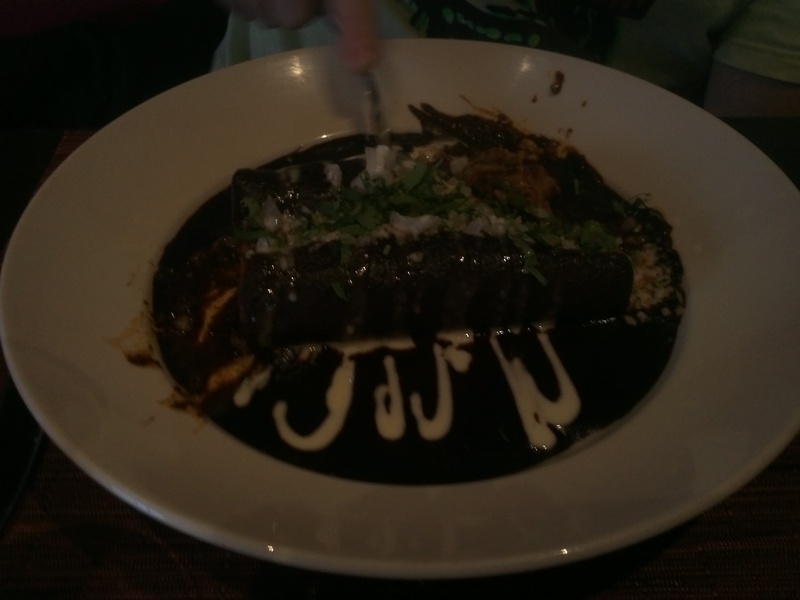 Bjorn was most impressed with the spicy beef in his enchiladas, the flavorful mole, and the smoky pasilla salsa. There was plenty to eat without getting stuffed. 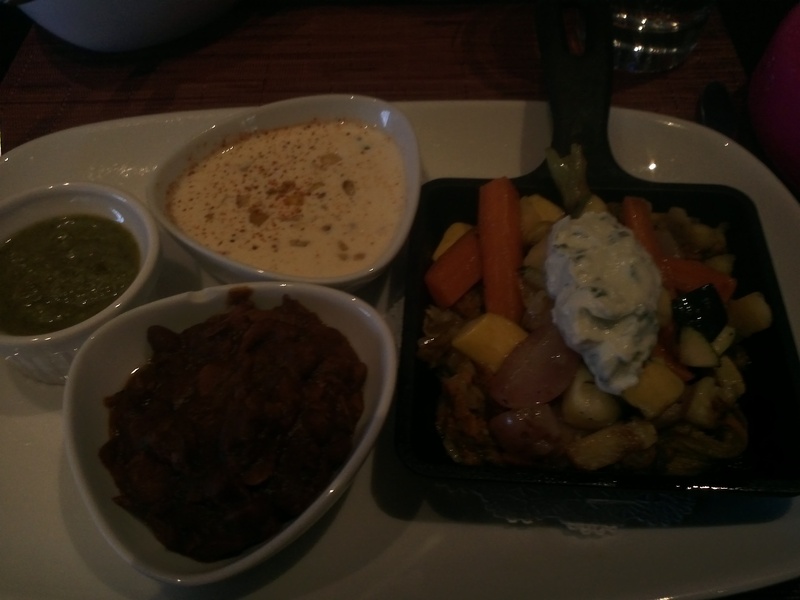 In addition to the great flavors, there were certain details of the food presentation that increased our enjoyment. The water was served out of pitchers containing ice, but there was no ice in our glasses. The separate serving dishes for each of the meal’s elements made it easier to enjoy their distinct flavors and textures without having them run together on our plates into a nondescript mass. We left just as it began to snow, feeling warmed, satisfied, and happy to anticipate a trip to Mexico in our near future. *Not that we need much help to get excited for a free, all-inclusive trip to Mexico in December. 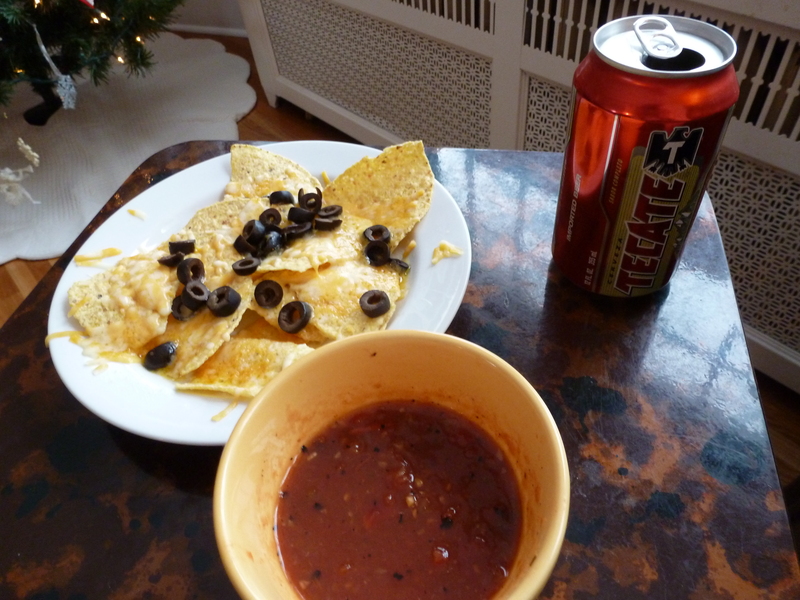 **The most authentic Mexican element of this snack is probably the beer. ***Sitting down to eat and write about this lead me to ponder why there is so much discussion of authenticity in preparing a regional cuisine when we are so blooming far from locales where these cuisines originate? I think people want you to know that with exceptions of home-cooked meals by people who learned at home, and restaurants that pay attention to authenticity, what you make in your Midwestern home and eat at most Midwestern restaurants is nothing like the local cuisine of say, Tuscany, or Jalisco. Nonetheless, there are some nods in that direction, and it is great to enjoy food with a measure of global curiosity. At the same time it is important to understand and appreciate the truly traditional and authentic approach to cooking and eating from different parts of the world. If I ate only the traditional dishes of our region, I would go pretty hungry as a vegetarian. ****Save for Masa, another downtown Minneapolis where the decor and all surfaces in the restaurant are stark white.